How do I give my payers the ability to change the amount of their recurring plan? Payers can manage their recurring plans within the Payer Portal. We automatically restrict the changes they can make to the amount of their recurring plan based on the settings you have in the Amount section of the form they checked out on. Example 1: You only have one amount of $10 on the form they checked out on. 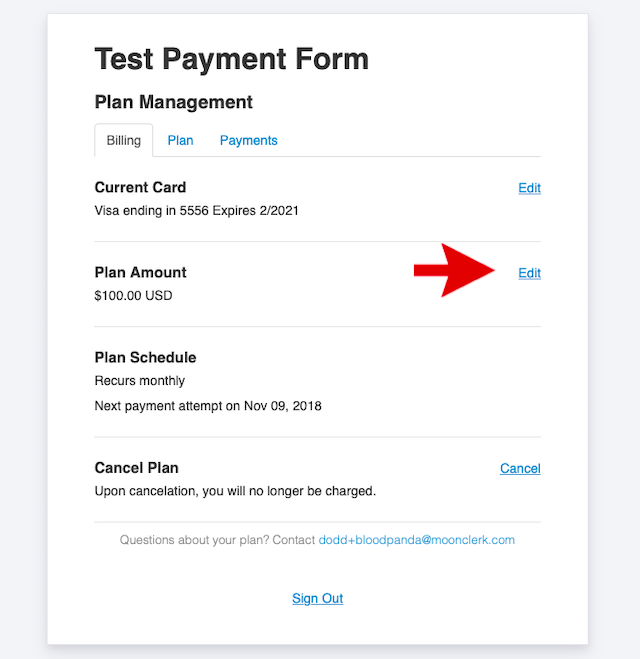 Even if you've enabled payers to change the amount of their recurring plans in the Payer Portal, in this scenario, payers on this form will not be able to change their plan amount. Example 2: You have three amounts of $10, $20, and $30 that payers can choose from on the form they checked out on. If you've enabled payers to change the amount of their recurring plans in the Payer Portal, in this scenario, payers on this form will be able to change their amounts to any of the 3 amounts you have on the form, but not any other amounts. Example 3: You've left the amount section of the form "open" so that the payer decides the amount at checkout. If you've enabled payers to change the amount of their recurring plans in the Payer Portal, in this scenario, payers on this form will be able to change their amounts to any amount they would like. 5) Now, when your payers go to their Payer Portal, they will be able to change their plan amount according to the parameters you've set in the Amount section of the associated MoonClerk payment form.